Realme has finally revealed when the next smartphone is coming after teasing it during its Realme 2 announcement. But instead of one date, the company just gave out two dates in its press invites - September 26 and 27. Surely, one of the dates is reserved for the official announcement while the other remains a mystery for now. 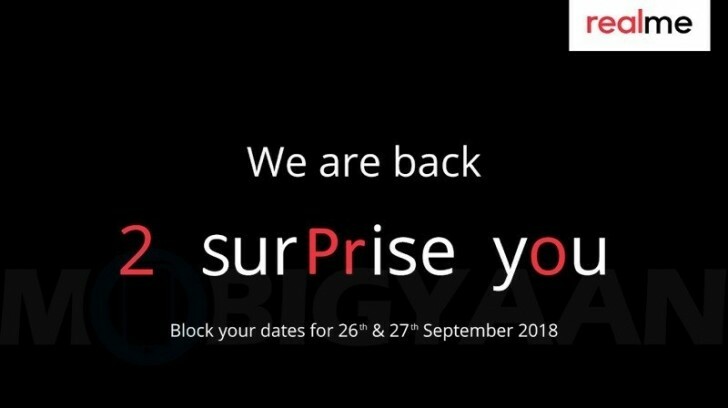 It was confirmed by a Realme representative that the 27th will be the announcement date and even though the press invite doesn't explicitly say it's about the Realme 2 Pro, the highlighted letter clearly indicate it's the Pro we are waiting for. But the A7x is also a rebranded phone and would launch for around 15k. Well, It can't be A5 because it is an identical phone to realme 2 or oppo a3s. Oppo A7x will be and should be the Realme 2 Pro.